In 1978, at the age of 16, my father drove me from Mendham, New Jersey to Stowe, Vermont to study landscape painting with Frank Mason. The class met three times a week for four weeks in June. The days the class didn’t meet, I would paint on my own or with other students. Painting outside on location from nature, also known as ‘plein-air’ borrowed from the French, would be the format of the class. We painted different times during the day mostly early morning or late afternoon; one class devoted to a moonscape. Frank taught myself and the other students the basic principles of landscape painting. More importantly, he taught us how to create three dimensional space on a two dimensional surface using color and value. After a month of painting outside with this instruction, you begin to see the whole world differently. As a result of this teaching, I remember the ride back south to New Jersey looking at the colors in the hills with a newfound awareness and appreciation for the quality of light and atmosphere of the outdoors. 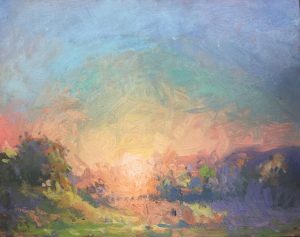 Frank learned these principles of painting when he was sixteen in Old Lyme, Connecticut where his teacher Frank DuMond spent the summers painting and teaching . Between the two of them, they taught countless students spanning 120 years. Following tradition, I am offering a four week class which includes their teaching principles of landscape painting. The class will be taught in southwestern New Hampshire where I paint and reside. In addition, we will be painting outside on location using the same palette of colors that DuMond and Mason used. This palette is known as the DuMond Palette or Prismatic Palette. For information on the class, please call 603-357-7437 for availability.